My first proper go at doing a black and white image, not really processed one before, tried to give it a gritty dramatic look..
Hope you like and please comment as it's a first for me so it's a learning curve. I know it's a bit Central, but then it is the Central line I considered cropping a bit off the left side, but I thought the other engine disappearing in the distance balanced it up a bit. Last edited by TonyT; 28-01-2019 at 23:15. I like the shot as it's always good to see the engine working hard. There several ways to do this. In this case I have used a combination of a levels adjustment set to screen and masked to reveal the engine and a blank layer set to overlay using a low opacity (circa 10%) soft brush to paint white on the blank layer where I wanted extra brightness. I also cropped a little of the left side which, although it centralises the engine a little more, has the effect of appearing to create more space on the right for the engine to move into. That works, oddly enough you have cropped it exactly where I originally did, but for some reason I moved the crop, will have another play at it tonight. had to work the sky to death to get it like that, it was more or less white when taken as I forgot my polariser and filters. I think I have figured out why its a bit dark, I added a second graphics card into my PC and havent recalibrated the screen to take into account I am running two cards. will sort that and retweak too. Last edited by TonyT; 29-01-2019 at 13:11. 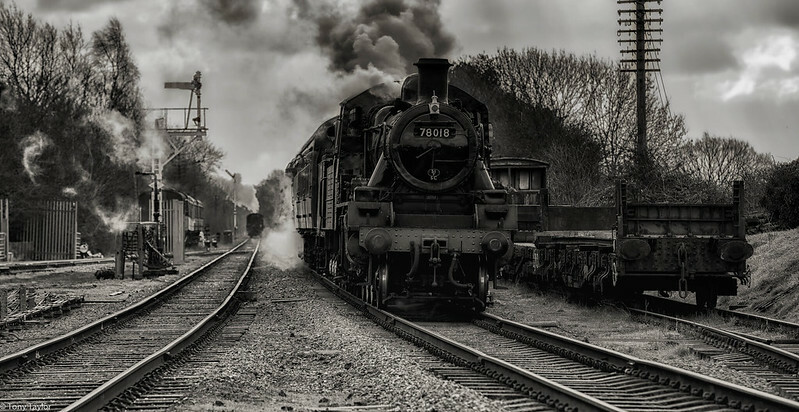 Nice image Tony, steam loco images seem to look better in black and white. That works for me. Looks old and nostalgic.